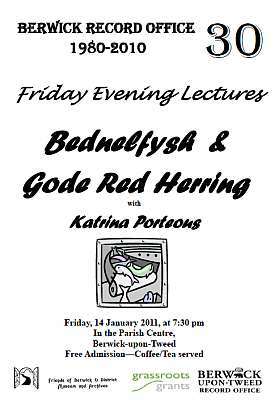 Berwick Record Office begins its 2011 programme of events celebrating its 30th anniversary with a talk by Katrina Porteous on fishing and fishing folk in North Northumberland, in particular, the village of Beadnell. Everyone is welcome to attend this free talk by Katrina who has carried out extensive historical research on her subject. It's on Friday, 14 January 2011 at 7.30pm at Berwick Parish Centre, Berwick-upon-Tweed, TD15 1DF, England. Map. It's next to Holy Trinity Church. Entrance is through the churchyard. The suggested car parking is near the Barracks and Wallace Green. Katrina’s talks and guided walks in the area always prove very popular. Don’t miss this one!